Announced almost a year ago, United Airlines are finally putting their premium economy seats on sale for general purchase. Sitting somewhere in between business and economy class, the Premium Plus dedicated cabin promises improved comfort as well as some service upgrades too. The seats have been installed in the aircraft for several months now, as the retrofit rolled out across the fleet. Some passengers may already have travelled in their ‘Economy Plus extra legroom seats’ at no additional cost, but now these seats and the accompanying service upgrade are available to purchase direct. Being introduced on United’s 777-200ERs, 777-300ERs and their 787-10s from the end of March onwards, Premium Plus fares went on sale yesterday. By the end of May, bookings from their three US hubs will be available to 21 international destinations. What can we expect from Premium Plus? We previously reviewed the benefits that will come with Premium Plus seats, but essentially they will offer more legroom, more elbow room and an increased incline. Laid out in a 2-4-2 configuration, this is two seats fewer across than in the economy cabin. The cabin itself is separated from the larger Polaris business class and economy cabins by walls at the front and back. Service wise, customers in Premium Plus will get free upgraded meals served on real plates with cloth napkins (fancy!). Snacks and alcoholic drinks are complementary throughout the flight. They will also be given an upgraded amenities kit, a Saks Fifth avenue blanket and a plush pillow. Extra storage is available, as well as noise reducing headphones, extra power outlets and a larger IFE screen. There’s no lounge access included, but passengers do get two free checked bags and Premier Access check-in and boarding. Release of the Premium Plus seats will be staggered, with the bulk added by March 30th and more released at the end of April and by May 22nd, 2019. The cost of upgrading to Premium Plus from economy and the comparative cost of a business class seat is really variable depending on the route and time you fly. We took a look at some round trip flights in May which had opened for United Premium Plus bookings to see what sort of costs we are looking at. 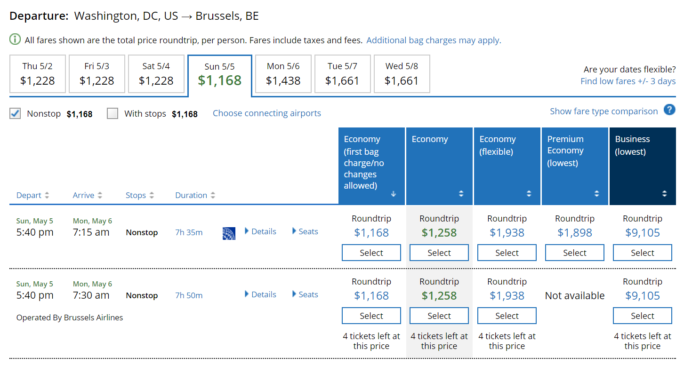 Newark to Paris in May would cost $806 on the lowest economy fare for one adult. An upgrade to Premium Plus would add $1,803 to that ticket, which is a hefty price to pay. To upgrade to proper business class would cost another $1,000 again, although it you’re breaking the bank for your trip, the upgrade to PP doesn’t seem worth it. For a longer haul, we looked at Newark to Hong Kong at the same time of year. This was a far better deal, offering the upgrade for a shade over $500 per person. In comparison, to travel business on the same flight there was a price difference of +$5,589 over premium economy and more than $6,000 over the cheapest economy. Probably destined to be one of the more popular routes for premium seats will be the San Francisco to London flight. For this ticket, an upgrade from basic economy just about doubled the price, making a round trip $1,518 compared to $723 on the cheapest ticket. Again, this is a great saving over business class, which came in at a hefty $5,042, over $3,500 more than the Premium Plus fare. Finally, we had a look at one of the last routes which will be added to the schedule; Washington to Brussels. For this trip, Premium Economy bumps up the fare from $1,168 to $1,898, just $365 each way to upgrade. 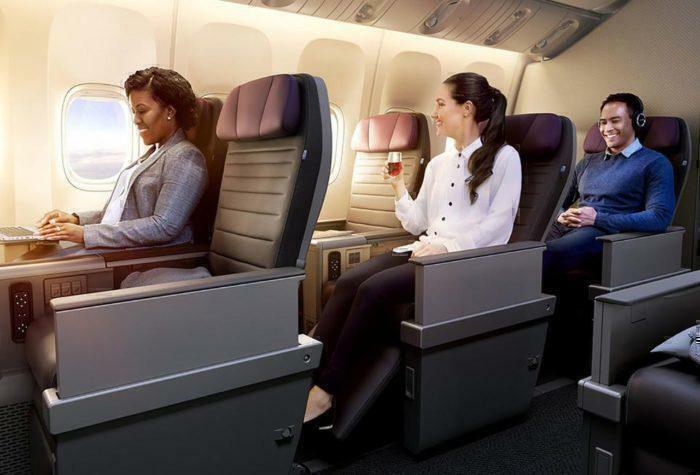 Conversely the business class fare ran to over $9,000, showing perfectly how Premium Economy could bridge the gap for those not wanting to be squished in coach, but unable to upgrade to business. We felt the award fares offered less value on some of these routes than perhaps a paid for ticket would, with all routes requiring at least double the miles to travel premium economy (in some cases quadruple). Our SFO to LHR flight could be taken on just 30,000 miles with a Saver Award, whereas Premium Plus would require 120k miles for a round trip. With Business class available for just 35k miles more, its difficult to see how PP would be an attractive option. Some examples of awards are below, but the specific award you can bag will obviously depend on the status you’re flying with as well as the award availability at the time of booking. United has said you will be able to use MileagePlus miles to upgrade to premium economy as well as to business class. However, prices and details on this are not yet introduced. If you’re travelling with Global Premier Upgrades, you should still be able to upgrade directly to business class. With this being dependent on availability, you can also request to upgrade to either business class or premium economy, which gives a better chance of bagging an improved seating option for no extra cost. United have said that, although they will move you to the first available seat, if that seat is in Premium Plus, they will continue to look for space in the Polaris business class cabin without any additional upgrade requests necessary. On the surface of it, Premium Plus looks to be filling an important gap in the cash fares offerings. For many travellers, Business class is simply out of reach, so a premium economy product offers an affordable alternative for those wanting a little extra space without an eye watering fare. But is the upgrade worth it at all? United are the last of the US ‘Big Three’ (Delta, American) to offer a premium economy product on their flights. Many other airlines already offer premium economy, and many of those who don’t will be introducing it (or upgrading it) pretty soon, including Finnair, Air France, Emirates and Etihad. 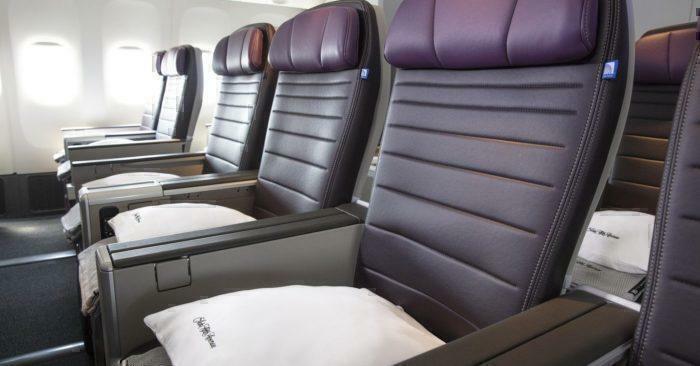 So, why the big rush for premium economy? We’ve discussed before how good premium economy is at making money for airlines, essentially enabling them to sell something for double the price which doesn’t cost them twice as much to produce. In terms of United’s Premium Plus product, it’s a lot of extra fare for not much extra space. If you’re particularly tall or want to work during the flight, it could be a worthwhile investment from your point of view. But, overall, it’s pretty poor value for a product that isn’t a patch on the Polaris business class offering.